Proof! is a combination of desktop, mobile, and web app for Proof of Service notifications and Inventory Tracking. A bar code tag is secured on equipment inventory and technician vehicles. By scanning the bar code (via smart phone, iPhone, tablet, or iPad), you can track job sites, current driver locations, service completion, and inventory movements. Proof! can be used as a stand-alone product; therefore, there is no need to change your existing software; and since your technicians already have smart phones, there are no special bar code readers to buy. Proof! and bar code tags are the only additional expenses. THERE ARE FIVE COMPONENTS TO PROOF! Set up information related to customers, job sites, contact info, email addresses, text and voice numbers, warehouse and inventory information, technicians, supervisors, vehicles, and mobile devices. A technician scans units as they are delivered, picked up, and serviced, or to notify of reasons service could not be performed. Data is sent to email and text manager automatically, and then to the customers and job contacts, as necessary, according to customer preferences. Map view of all inventory locations. Determine who the customer is, who and what truck is the closest to it, etc., and make prompt and appropriate changes/decisions. Service and delivery history of inventory usage throughout its life. Email/Text manager - To automatically send customers their Proof! It senses any new scans that come from the Technician and Supervisor apps and automatically sends emails and texts to either the customer contact, the job site contact, or both. When a technican is scanning out in the field, he/she can assign the type of message to be sent, such as Delivery, Pickup, Service, Not Serviced, etc. The types of messages are customizeable, as is the wording. The customer (or job supervisors) can log in, view and print their own history...Their own Proof! When the supervisor logs in, he/she only sees the jobs he/she is associated with. When the customer logs in, they choose which job they would like to view, and then view the complete history for that job. Bar code tags are not included with the software, but may be purchased separately. Bar code tags must be rigid, durable, compatible to your work environment, and resistant to chemicals, abrasion, solvents, extreme temperatures (both hot and cold), UV, and outdoor exposure. We recommend metal bar code tags of at least .020" thickness that comply with these requirements. In addition, there are various bar "code" types. 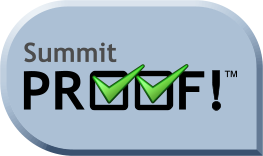 Type 39 is what works best with Summit Proof! If you are interested in purchasing bar code tags, please contact us. We can often combine orders for volume discount pricing. Choose Monthly or Standard Licensing to fit your needs and budget. Intro Video - Proof 1 Intro Video Proof 3 More Coming Soon! Intro Video - Proof 2 More Coming Soon! More Coming Soon! Desktop App - for initial setup and reporting of history, technician time tracking, etc. Customer Web Portal to check their own Proof! -Add Desktop and Supervisor apps for the office, as needed. -Add Technician Apps for additional technicians out in the field. -Add Supervisor Apps for additional supervisors. -Bar code tags are not included with the software. If you are interested in purchasing bar code tags, please contact us. We can often combine orders for volume discount pricing. *Some Summit software products utilize email services, SMS text messaging services, merchant card processing services, mapping services, and mobile services. To take advantage of these options, users would need to have accounts, such as email, with their chosen vendor in order to use that feature. 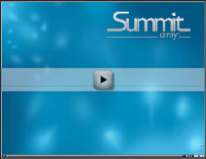 Links to certain, specific vendors have been programmed into Summit software, and any questions should be directed to sales, training, or technical support. +Requires commitment and enrollment in monthly subscription for Cloud storage, Back up & Continuity. Data import/conversion from your old program.